The next major release of GAP 4.10.0 has been announced on 12 November 2018. Its complete overview with links to the GAP documentation and GitHub pull requests can be found here. Alternative distributions – Gap.app for macOS and GAP Docker container have been updated too. You can check the status of standard tests of GAP packages from GAP 4.10.0 release on Travis CI. Out of 140 packages, redistributed with this GAP release, 103 now provide such a test, and for 97 of these packages their tests pass cleanly. To compare, in GAP 4.7.9 (November 2015), only 56 packages had standard tests. But not only more tests were added over three years, but also their code coverage improved, as you can see by exploring code coverage for GAP packages at Codecov. This is a result of collaboration of many GAP developers and package authors, helper by keeping many package repositories on GitHub (see https://gap-packages.github.io/) and providing tools for package authors to automate testing and publishing releases, and keep a regular release cycle. In particular, in GAP 4.10.0 distribution, 103 packages have been updated in 2018, another 20 – in 2017, and 6 more in 2016. On the other hand, there are 2 packages dated 2011, 2 – 2012, 5 – 2013, 1 – 2014 and 1 – 2015, but no packages from 2000s any more! GAP 4.10.0 contains the new release of the JupyterKernel package by Markus Pfeiffer which allows to use GAP in a Jupyter notebook. This development has been supported by the OpenDreamKit project. You can try to use it remotely on Binder or install it locally as explained in its manual. One of the new packages from GAP 4.10.0, based on the Jupyter kernel for GAP, is francy by Manuel Martins, which provides an interface to draw graphics using objects. Another package is JupyterViz by Nathan Carter. It adds visualisation tools including standard line and bar charts, pie charts, scatter plots, and graphs (i.e. vertices & edges). Both packages also offer an opportunity to explore them on Binder (click on “launch on Binder” badges in their README files on GitHub). Remarkably, there was no beta release this time. The new GAP 4.10.0 release is a proper official GAP release. With publicly available repositories for GAP and the majority of packages, and with the improved testing setup, the need in a preliminary beta release simply disappears. The GAP testing dashboard shows how code coverage (collected at Codecov with the help of the profiling package by Chris Jefferson) improved over releases. The GAP testing dashboard also contains badges for Travis CI builds which test GAP packages. We test released and development versions of packages with released and development versions of GAP in various settings. ReleaseTools – a script which automates the process of making a new release for a GAP package hosted on GitHub. GitHubPagesForGAP – a template for setting up a website for a GAP package hosted on GitHub. The new minor release of GAP, version 4.9.2, is now available for download from the GAP website at https://www.gap-system.org/Releases/. It includes the new JupyterKernel package by Markus Pfeiffer which provides a so-called kernel for the Jupyter interactive document system. This package requires Jupyter to be installed on your system (see instructions here). It also requires GAP packages IO, ZeroMQInterface, json, and also two new packages by Markus Pfeiffer called crypting and uuid, all included into GAP 4.9.2 distribution. The JupyterKernel package is not yet usable on Windows. The complete description of changes introduced in this release, with links to the documentation and to GitHub pull requests is available here. Please also see the release announcement in the GAP Forum. The new major release of GAP, version 4.9.1 release, is now available for download from the GAP website at https://www.gap-system.org/Releases/. The complete description of these and other changes, with links to the documentation and to GitHub pull requests is available here. Please also see the release announcement in the GAP Forum. GAP 4.8.8 release, which also includes 30 package updates, has been announced today and is now available for download from the GAP website. Please also see the release announcement in the GAP Forum. This summer Leonard Soicher (Queen Mary) and Patric Östergård (Aalto) published the preprint with the same title, in which they successfully used GAP to solve a 40-year-old problem about the existence of a partial geometry which has the McLaughlin graph as its point graph. The calculation, which used GAP and its GRAPE package, took about 250 core-years. Peter Cameron wrote a blog post about the significance of this result here. We present a guest blog post by Alexander Konovalov, in which he mentions a number of activities that were partially or fully supported by the CoDiMa project. The original version of the post is located at his homepage. This post is based on my earlier comment on the pull request number one submitted to the GAP repository on GutHub a little bit more than a year ago. Of course, GAP is not new to the version control. The first revision in the CVS repository for GAP 4 is dated July 3rd 1996. Then 16 years later, in summer 2012 the repository had been converted to Mercurial (thanks to Max Horn!) after the release of GAP 4.5. In February 2015 the Mercurial repository had been converted to Git (thanks to Chris Jefferson! ), and we started to host it on GitHub at https://github.com/gap-system/gap. That’s more than one new pull request a day! While the ratio for open/closed issues is nearly 50:50, “if things are done, they are done”: pull requests are normally reviewed and getting merged, so the ratio open/closed for pull requests is about 1:10. We had several very productive GAP Days in Aachen, Trondheim and St Andrews. We have a gap-system virtual organisation on GitHub which also hosts repositories for other development tools, GAP Website, etc. We have an expanding virtual organisation for gap-packages. There is even more activity with GAP packages, since some of them are openly developed elsewhere (we are trying to keep an up-to-date list at this page). There is an active open GAP development mailing list. There is also a growing Wiki with documentation for developers. In 2015, we made two minor releases based on the stable-4.7 branch of the GitHub repository (4.7.8 and 4.7.9). We put a lot of efforts in making GAP more robust and test it better, in particular, we now run nightly check of the code coverage and publish code coverage reports. And we have just announced the first major release of GAP 4.8.2, which is the first major release of GAP that has been made from this repository! The overview of changes between GAP 4.7 and GAP 4.8 highlights most significant ones, including support for partially variadic functions, better tools for testing, debugging and profiling, function calls with timeouts, 12 new packages redistributed with GAP, and other changes. Congratulations and thanks to everyone who worked on making all of this possible!!! 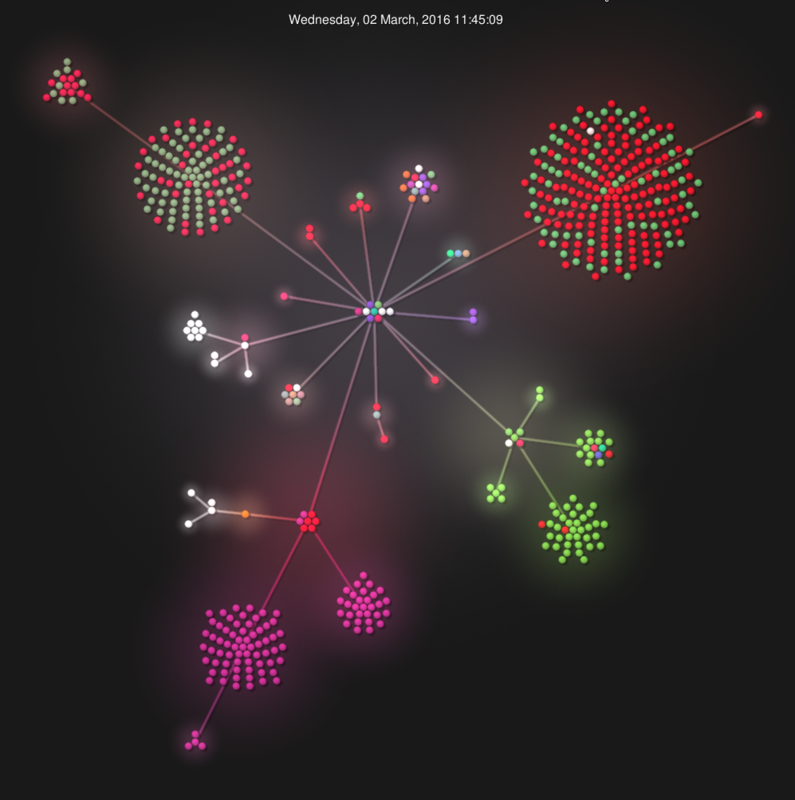 In addition, this visualisation, produced with gource, shows files and directories that were modified in the master branch of the core GAP system during the 1st year on GitHub. The large cluster in the top right corner corresponds to the GAP library. The top left corner is occupied by the GAP kernel. The pink cluster in the bottom represents GAP regression tests, and the main GAP manuals are marked by green. There are already changes waiting for GAP 4.9!